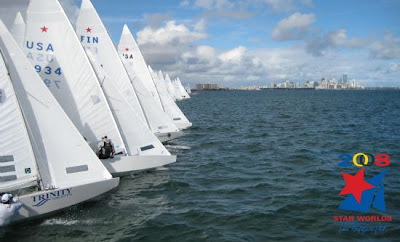 Miami, FL – The top ranked Star Class sailing team of Mateusz Kusznierewicz and crew Dominik Zycki made it two bullets in a row today, the second race of the 2008 Star Class World Championships at Coral Reef Yacht Club. “We are smiling today,” said Kusznierewicz. “Sometimes people have just a good couple of days.” He and Zycki crossed the finish line one minute and 20 seconds ahead of second place finishers Marin Lovrovic Jr., and crew Sinsa Mikulici who move up from 29th place to 9th overall. Kusznierewicz/Zycki were second around the first mark, passed the Croatian team before the leeward gate, and continued to increase their spread on the next two beats. “Dominik and I were talking about everything but sailing on that last beat,” said Kusznierewicz. 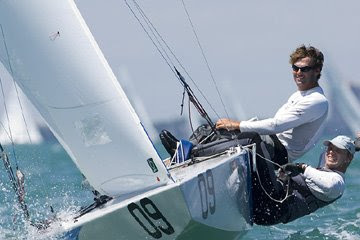 The Italians, Diego Negri and crew Luigi Viale, ranked second in the world, took another third place finish moving them up to 2nd place overall. “We decided to be more conservative at the start line then we went left looking for the first big shift and found it,” said Negri.